The erection of a huge Confucius statue in front of the National Museum of China has nothing to do with politics. The following is a collection of messages published during the two sessions on the official microblogs of caijing.com.cn. 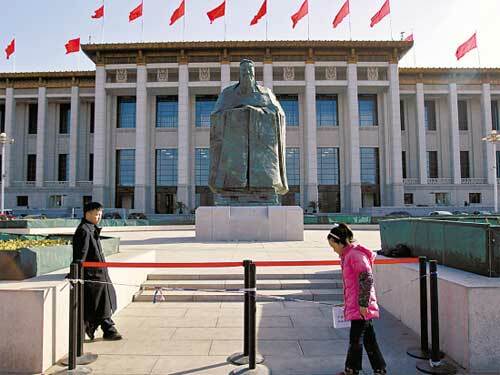 【A matter of culture rather than politics】The erection of a huge Confucius statue in front of the National Museum of China has nothing to do with politics. Items at the National Museum are of great value to both history and art, so the building itself should also embrace history. Confucius embodies the country's historical and cultural achievements. He was one of the world's top cultural icons, together with Socrates, Jesus and Buddha. Western countries all erect statues in front of their famous museums. It would be better to interpret this act from a cultural perspective. Excerpts reflect the views of microbloggers, not necessarily those of China.org.cn.